Hot air balloon festivals are fantastic events for all of the family to enjoy. Whether it’s your first time seeing a hot air balloon up close, or you are an enthusiast with years of balloon flight experience, why not take a look at our favourite hot air balloon festivals from around the world? You never know, it could be inspiration for your next trip abroad! 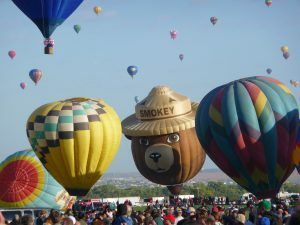 This year, over 600 balloons and 1000 international pilots the world will come to celebrate their love of hot air balloons in Albuquerque between October 6th – 14th. Spanning over 350 acres of New Mexico land, the festival has earnt the title of “the world’s most photographed event”. Perfect flying conditions due to the climate and location of Albuquerque means the Fiesta is a success year after year, leaving no room for disappointment for spectators. Founded in 1973 with only 13 balloons to its name, the fiesta has grown exponentially year after year and has held numerous and prestigious balloon races including the famous annual Coupe Gordon Bennett in 1993 and 1999. It was the birthplace of the America’s Challenge Gas Balloon Race which has been breaking flight distance race records dating back to 1912. Held over a nine day period, and as Canon as the main presenting sponsor, the Fiesta definitely means business! Just like the Bristol International Balloon Fiesta here in the UK, the event schedule is brimming with events and shows from 6am all the way through to 8pm, with entertainment from country music artists and other genres to please everyone’s ears. Lorraine Mondial Balloon Festival, also known as Metz to us balloonists, has made headlines in Europe for setting world records since it was founded. Held in an iconic setting of a disused NATO airfield in Chambley, Eastern France, it has been named as Europe’s biggest balloon festival attracting thousands of spectators and balloonists annually since 1989. Last year the Metz Hot Air Balloon Festival broke the world record for the most hot air balloons taking off in succession, which you can watch here. Four hundred and eight balloons took to the skies to beat the previous record of 343 which was set at the same festival, only a few days before. During the 10 days of balloon festivities, approximately one thousand hot air balloons rides take place, with pilots coming from 70 different countries to share and celebrate their enthusiasm for balloon flight. Mondovi hot air balloon festival is known as the secret gem on the balloon event calendar. Due to its laid-back schedule and non-commercial, ‘simple ballooning’ approach, held in early January this year. Located in the North-West region of Piedmont in Italy, the festival highlights the skill and knowledge of the pilots, focusing on the technical approach to balloon flying. The three-day balloon celebration encompasses all that the beautiful Italian culture has to offer, from food stalls to arts and crafts. The advantage of a non-corporate affair means minimal stress for organisers, and more time for the pilots to portray their passion for the sport and relaxing with family and friends, with up to 30 balloons taking flight. Ultramagic balloon company, established in 1978, holds a successful reputation for quality balloon manufacturing and is one of the organisers of the 22nd European Balloon Festival in Spain. To say this festival is one of the best in the world is an understatement! Bringing together the beauty of the sport, as well as the aspect of the flight and competition element, the EBF attracts pilots and balloonists from countries such as Argentina, Brazil and Israel, plus many more. Incorporating several locations around the city of Barcelona during the 12th – 15th July, and with many activities such as a photograph competition, reception of the pilots and a jaw-dropping city flight, it is one not to be missed by enthusiasts and locals alike. As a leading manufacturer which drives innovation in the balloon industry, be sure to check them out if you are heading to the European Balloon Festival next year! Aerosaurus Balloons is a great supporter of all hot air balloon festivals around the world. If you would like to experience a balloon flight a little closer to home, contact our friendly team today who will be happy to talk through flight availability and offers.